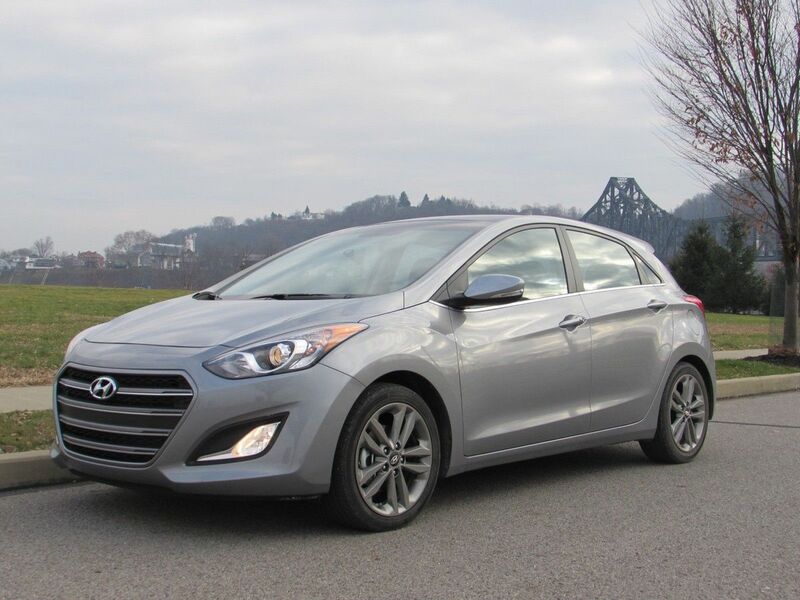 Even though the 2016 Hyundai Elantra GT is classified as a midsized car, it feels and behaves like a compact. The egg-shaped side profile of the GT provides the appearance of a small four-door hatchback, but look inside and you will see a well-equipped and comfortable interior for four adults. Under the hood is a 2.0L 4-cylinder producing 173 horsepower and 154 lb-ft of torque mated to a 6-speed automatic and front-wheel drive. Power from the engine is smooth and adequate for a car of this size. The transmission offers a manual setting so you can manually change gears if you wish. Exterior styling is simple and fluid. The egg-shaped profile I mentioned earlier is evident from the moment you see it, but it is not unattractive. Up front, the pronounced grill flanked by projector headlamps and fog lamps are a part of the refreshed design for 2016. Follow the body lines to the rear tailgate and you will see full LED lights and a hatch to open and load your stuff. The trunk area is useful, but will not hold large items like hockey bags or large pieces of luggage. Interior design and layout follow other Hyundai models and are extremely easy to learn and use. Push-button start/stop, Bluetooth and touch-screen navigation are all nice options in a car of this price. Available remote start from your smart phone is another option Hyundai provides that may be attractive to consumers. Seating is comfortable and even the rear seats are large enough for adults. My sons' car seats fit well and had plenty of room as to not intrude on front passengers. Rear-view camera is another option you can add for a sense of safety. On road the GT handles well, but not as tight as I expected. At the same time, it behaves like a car of much higher pedigree. Doors feel solid, steering is responsive and adjustable, but the car overall feels a little bigger and heavier than it should. Interior refinement and quality masks the fact that it doesn’t react on road as well as it should. There are definite pros when speaking of the GT, though. Gas mileage is very good and I averaged 28 to 30 mpg during my evaluation; Hyundai claims an average of 27 mpg. Seating for adults is very comfortable and the options available for this car make it an attractive option for people looking for a midsized five-door vehicle. Cons include the underwhelming driving characteristics. Entering into corners, the car feels a bit loose, and bumps are fairly harsh, although that may be due to the 17-inch alloy wheels. MSRP for the Elantra GT is $19,800, but after you add the Style and Tech packages the bottom line jumps to $26,675. The style package adds the larger wheels, fog lights, sport suspension, turn signals on the mirrors, aluminum pedals and the push button start with smart key. The Tech package adds the panoramic roof, leather seats, LED tail lamps, vented front seats, navigation, rear camera and auto headlights.